Construction firm Jaiprakash Associates Ltd’s shares fell by almost 7% on news that the company sold some of its treasury shares in block deals and raised about Rs1,100 crore. Treasury shares are unissued stock of a company, or previously issued shares that have been reacquired by the corporation. In mid-June, when the company had raised Rs500 crore through a similar share sale, the stock had corrected by about 7%. In late December, when it had announced the creation of treasury sales after merging three subsidiary companies and one promoter-owned entity with itself, the shares had fallen by 16% in three trading sessions. While the initial concern about equity dilution through the creation of treasury shares can be understood, the markets now seem to be missing the point that the sale of these shares is an extremely effective and quick way of raising capital for the company. Most companies are raising capital through qualified institutional placements (QIPs), which is a relatively quick way to raise capital, but it still takes about four-six weeks to complete this process. 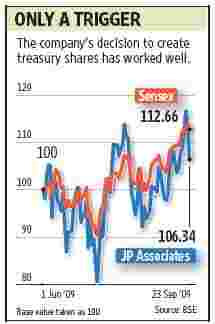 Selling treasury shares is a quicker process. This helps since market sentiment can turn negative in no time and raising capital can then become difficult. For a company such as Jaiprakash Associates, which is involved in a string of capital-intensive businesses such as power, real estate and construction, access to capital is critical. For this reason, when availability of capital had dried up earlier this year, the company’s shares had fallen to as low as Rs60 per share. With the funding environment improving, the shares have risen by about four times to the Rs240 levels. The company’s decision in December to create treasury shares instead of extinguishing shares during the merger process has worked well. If the company’s holding in its subsidiary companies had been extinguished, it would now have had to use fresh shares through a preferential allotment or a QIP issue. Not only does this take longer, but it has added complications such as a lock-in period for investors and pricing restrictions. Earlier this month, Citigroup Research increased the target price for the stock to Rs264 because of “earnings increases, market re-ratings for sectors in which the company operates such as construction and cement, and our more constructive view of valuations for the power and real estate businesses". At current levels, however, the upside for the stock is limited based on the above target price. In fact, the recent correction in the stock could well be because the stock is nearly fully priced, and the share sale may have only acted as a trigger for profit taking.